St. Columba was born, probably in County Donegal, in 521. He lived a quiet and monkish life until in c. 563 he decided to sail towards the east. He founded a monastery on the island of Iona, a really decisive event in Scottish history. His biography was written just a few years after his death by Adamnan, his successor on Iona. Columba is associated with the early Celtic church and especially Scottish Christianity. Having forged relationships with kings he established a network of churches and monasteries, one being on the island of Inchcolm in the Firth of Forth. Curiously enough I visited Inchcolm just a few days before picking this CD off my pile. In addition I am writing this in another decisive week that of the Scottish Referendum. 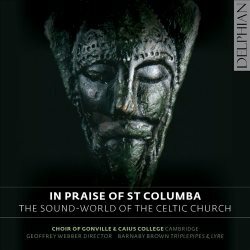 This CD explores what it calls the 'soundworld' of Columba’s environment. How it is done is quite complex. The extensive and fascinating booklet notes go into every detail of the performers' intentions. All I can do is to sum up. Its worth adding that the choir of Gonville and Caius under their now long-standing Director Geoffrey Webber are no strangers to rare and unusual repertoire. However, even by their standards this music is not only rare but has needed, in some cases, special research and training. For a start, let's take the Latin Ionan text Noli Pater which has been attributed to St. Columba. No one is quite sure whether or not Columba did write poetry but surely devotional verses such as these would have been appropriate to his character. We discover that the style of this duet performance has been adapted from a 1965 recording of the sisters, Murdina and Effie MacDonald from the Isle of Harris. In the recording their voices interlink and sometimes overlap. On occasion one leaves the other voice to finish the line. On the present disc Susannah Bagnall and Catherine Baumann carry it off wonderfully. Later, two men (Philip Kennedy and James Robinson) oddly enough, do the same with another canticle from the Columban office Volens Jheusus linere. If you are in general agreement with Oscar Wilde who said that a definition of a gentleman is “one who can play the bagpipes but who chooses not to”, then you may not empathise with the plainsong melodies when they are accompanied by pipes. To be precise what we hear are triple pipes and they are joined by the Irish horn. I have found this approach convincing. It has the effect of lifting the plainchant up a gear, as it were, with added expression, power and relevance to the subject matter. Stone carvings, of which two are illustrated, help to give us some clue as to these instruments. Their use is certainly found in 8th-10th century representations in England let alone Scotland and Ireland. Instruments were not permitted in church but there is evidence to show that it was indeed often clerics who played them and certainly weddings and special festivals would have used them as in ancient Rome and Greece. The Bodhrán used in just one track is just a goatskin-covered hand drum. The sources and inspiration behind the programming are threefold. Of primary importance is the island of Iona through the poets who supply several texts some attributed to the saint. Secondly the 14th century ‘Inchcolm Antiphoner’. I mentioned that I had visited this beautiful island in the Firth of Forth, approached best by boat from Queensferry, only a few days before listening to this CD. It is quite an extensive ruin and I took part in a Sunday morning service in sunshine, which amazingly, included accompanied plainchant. There is also Swiss source from Einseiden and St. Gallen of the mid-10th century where music and poetry were created in monasteries founded under the Columban influence. An example is Amen dico vobis, a Galician chant, by the way, and quite a rarity. The ‘Soundworld” of the Celtic Church can be particularly illustrated by Altus prosator. This is a vast sprawling poem probably written on Iona in the late 7th century. I quote the track-listing: "Music by Barnaby Brown, weaving Hebridean tradition with the Welsh ground ‘Koraldan’ and medieval sequences from Germany". The verses are sung ‘in alternatim’ male, female and soloists although there is little historical evidence for this. The choir are accompanied by Barnaby Brown himself who strums on the lyre to keep the pitch. At the verse ‘Tuba primi archangeli’ the Irish horns strike up, first in unison, later adding some harmonies. Earlier in the disc there is a duet, an improvisation entitled the River Erne duet for the two horns, which demonstrates some of the variety of eerie noises this instrument can make. Although the approach to rhythm is generally free and unbarred, as it were, Cantimus in omni die is given in compound time using a melody from 13th century Compostela although the text is from 8th century Iona. It is accompanied by the pipes and percussion. The manuscripts only indicate the melodies by a series of neumes, which for many years proved impossible to interpret. The booklet illustrates the opening of the text and music for Liberasti nos Domine. We are told that the choir sometimes sang directly from the manuscript reproductions for some items, no easy task. What with improvisation, vocal imitations of traditional singers, unusual instruments and scholarly delving, Geoffrey Webber, Barnaby Brown and Delphian have produced a generously filled and decidedly ambitious disc. These qualities are matched by the choir and the rest of the performers who have prepared and performed both immaculately and with imagination. The thirteenth century church at Horningsea has a lovely and lively acoustic. The singing of the plainchant is never routine and the diction is clear and distinct. The booklet essay is a good read and explains almost everything. There are colour photos of the performers including one of the choir, dressed in relaxed summer clothes, lounging on the ruins of Muckross Abbey in Ireland. Quite what they were doing there is never explained – but it’s a nice place.